A £400m redevelopment of East Kilbride town centre has been given the go-ahead by South Lanarkshire Council. The plan would demolish some existing buildings to create a new civic centre, a state-of-the-art health centre, a library and shopping facilities. Council leader Eddie McAvoy said it would make "the new town a boom town". The town already has Scotland's largest covered shopping mall, but the plan has more department stores, modern double height retail unit layouts for larger tenants and a restaurant hub around the ice rink to create a new evening destination. Parking spaces in the town centre would increase from 3,000 to 8,700 spaces. Mr McAvoy said: "It will benefit our whole economy and ensure that East Kilbride stays at the cutting edge of quality shopping well into the new century." However, he added that there was more to the redevelopment than shopping. "It's about local identity, it's about regeneration and above all it's about improving quality of life. "The scheme we have approved in principle will develop a more cohesive longer-term vision for East Kilbride." 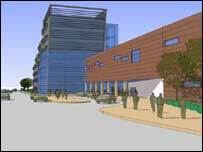 Artist's impression of the new civic centre and health centre. The announcement comes after a year of talks between South Lanarkshire Council and the Scottish Retail Property Limited Partnership (SRPLP), a joint venture between Land Securities and British Land. The first stage of the plan could start later this year, with completion of the major elements in 2012/2013. It is hoped the project - the various phases of which will require full planning permission - will create up to 3,000 temporary jobs over the 10-year construction programme and 2,000 permanent jobs.